Singha wrote: inside delhi also lot of these private cars operate as airport drops or day taxis. the driver makes sure to take the agreed upon fare before reaching the airport departures driveway lest anyone see it as a commercial venture and pounce. he acts as your personal driver. The best part such "business practices" have now been even taken into countries like UK . When I made my first visit to the UK, from Heathrow to Hounslow I became a pucca brown sahib and went using a London black cab. No refusal to ply, no haggling on the fare and he went by the meter. The finance folks at Veg.Oil.Co was not very happy when I gave them the bill. Next time around my UK counterpart had arranged my pick up. He gave me the number of the driver as well. I called up the number, and the driver asked me NOT to go to the area where black cabs or other registered cabs would be waiting. I was asked to come to another area where private cars (with relatives of the passengers) could wait. The driver a Sardar from Punjab then took me to the hotel using the services of Tom Tom. Had to really convince him, that I have no plans to camp in UK even when he kept on explaining the benefits of UK . Paid him much lesser than the black cab rates, for which he gave me a receipt (from one of the rent-a-car agencies). Reliance Infrastructure(RInfra) and Astaldi S p A (Italy) in a joint venture have bagged Rs 7,000 crore order for construction of the second sea link in Mumbai. The JV has bagged the engineering, procurement and construction (EPC) contract for Versova-Bandra sea link, RInfra said in a BSE filing. RInfa said the other bidders in the fray were L&T-Samsung JV and Hyundai Development Company-ITD JV. The 17.17 km long Versova-Bandra project will be three times the length of the existing Bandra-Worli sea link. The project is to be commissioned in 60 months, the company said. Thats ~400 cr per kilometer. There is no land acquisition cost unlike in Delhi EPE. India has surely become expensive. Why do we still need foreign joint ventures to build a bridge? hanumadu wrote: Thats ~400 cr per kilometer. There is no land acquisition cost unlike in Delhi EPE. India has surely become expensive. Why do we still need foreign joint ventures to build a bridge? No land acquisition costs, but there is babu acquisition costs. The higher cost is due to it being built on sea-bed. Cannot be compared to regular expressway. 'Cause many if not most of the construction/EPC companies are in no financial shape to take up the projects by themselves even if they have the technical credentials and expertise. One of the major reasons is one sided government contracts(with added paperwork) plus delayed payments for the work done. So a foreign investor is increasingly being sought after just to take up the project. It is another matter altogether after getting a taste of Indian system most of these foreign companies would say good bye to India forever. All in all look at the wisdom of our officialdom. First bankrupt the Indian companies and then go to foreigners to get the work done. Last edited by Suraj on 08 May 2018 23:35, edited 1 time in total. Suraj wrote: Multiple licences ? More detail please. That can happen in many ways. 1. Licenses under different identities. 2. Licesnses issued in different states, since regional RTOs are not really interconnected. Adding more to the 1st and 3rd part - most of the folks coming to driver and delivery boy background have multiple id documents having small differences to each other. Like having a chandra as middle name or not. Used to create multiple DLs for the same person. Even though finger print scanning is the norm, there is really no de-duplication unlike aadhar. Multiple DLs are problem similar to multiple PAN card. Solution is also same - link to Aadhar. Once linked, for the sake of enhanced compliance to law, some automated "restrictions" to the connected financial services should be made. Like once an challan is given via automated system with photographic evidence, a restriction on cash withdrawal from the ATM till the challan is paid or contested in the court and so on. It is not about investment but more so about the technology and the design. The indian industry is merely a service industry with no technical capabilities. Its a shame that so many engineers and our biggest companies are service based. Example is Micromax. Again based on services model but zero technical capabilitie and will to invest in R&D. Astaldi is not an investor. They are a construction and engineering firm. They were the main contractors for a range of projects like the Rome Metro, Naples Metro and other large projects in their own country. The lack of sizeable homegrown heavy engineering and construction firms capable of taking on and executing largescale projects like this, is a glaring weakness still. The East Asians all have several major companies capable of building things like this. The main contractor for Burj Khalifa for example, was Samsung's construction arm. Entities like RelInfra need in house capability, not just subcontract things to others, or JV their way every time. Suraj wrote: Astaldi is not an investor. They are a construction and engineering firm. They were the main contractors for a range of projects like the Rome Metro, Naples Metro and other large projects in their own country. The Indian partner is Reliance Infra(i.e Anil ambani group). I doubt they are in a position to execute such projects either technically or financially. Only time will tell whether decision to qualify them for this project was right or not. But yes there are Indian companies which are technically capable to execute projects of such complexity. But even they are in not so good shape. Infact didnt HCC complete the earlier sea link project. Did it require any foreign JV? Last edited by darshhan on 09 May 2018 18:54, edited 1 time in total. KVRaghav, In context of EPC/Construction industry, your statements above couldnt be further from truth. Indian companies have built up a fair amount of expertise in all aspects of construction from design and engineering to execution. Sure some gaps are there in certain domains such as tunneling etc, but by and large we are doing pretty good. I would rate Chinese and koreans above us. That is about it. Most overrated are western companies. Picklu wrote: Multiple DLs are problem similar to multiple PAN card. Solution is also same - link to Aadhar. A simpler solution has already been put up. The Central Govt. has come up with standardized softwares; Vahan and Sarathi using which registration of new vehicles and the issue of driving license would be done by every state government RTO. This has already been in a "pilot phase" in many states. With this, the case of issuing multiple DLs can be stopped to an extent. But yes, for complete stoppage on multiple DLs Aadhaar is the only way. In a major boost to defence logistics along the border with China, India's longest road and railway bridge connecting Dibrugarh in Assam to Pasighat in Arunachal Pradesh is likely to be inaugurated later this year by Prime Minister Narendra Modi. While all the civil work would be completed by July this year, two more months would be needed to finish the electrical and signalling work on the 4.94 km bridge, said Mahender Singh, chief engineer, construction, Bogibeel project. The bridge, which is the second longest in Asia, has three lane roads on top and double line rail below. The bridge is 32 metres above the water level of the Brahamaputra and is fashioned on a bridge that links Sweden and Denmark. As of now, the rail and road link to Arunachal is through three Assam bridges -- Jogighopa in Bongaigaon district, Saraighat near Guwahati, and Kolia-Bhomora between Sonitpur and Nagaon. This means that a cargo from Dibrugarh in the north-eastern corner of Assam takes over a 600 km detour merely to cross the Brahmaputra. The other alternative is crossing by ferry, but it is not suitable for heavy cargo and due to monsoons for six months between May-October, ferry services often remain disrupted. "Now, to go from Dibrugarh to Arunachal Pradesh by train, one has to go via Guwahati with more than 500 km detour. With this bridge, the journey will be less than 100 km," said Singh. Though approved in 1996, construction of the bridge was initiated by the first BJP-led NDA government in 2002. The Congress-led UPA government had declared it a national project in 2007. Approved in 1996, construction begun in 2002, inauguration in 2018.
it was trickle funded under indian railways for a loooooog time, all one could see were a few pillars sticking out of the water. Singha wrote: it was trickle funded under indian railways for a loooooog time, all one could see were a few pillars sticking out of the water. Quite a capable bridge, though. 5kms of double tracked broad gauge line below, and 3 road lanes plus pedestrian paths above. It's good to hear that two critical bridges have come up or will come up in rapid succession in a region that sorely needed it for a long time. Thanks for your local insights. ie because the new saraighat bridge is adjacent to the old saraighat bridge and hence of no extra utility in shortening the transport time or presenting a separate target to cheeni cruise missiles. 900km of a very big river and 5 bridges is a paltry number. only 3 are railway. 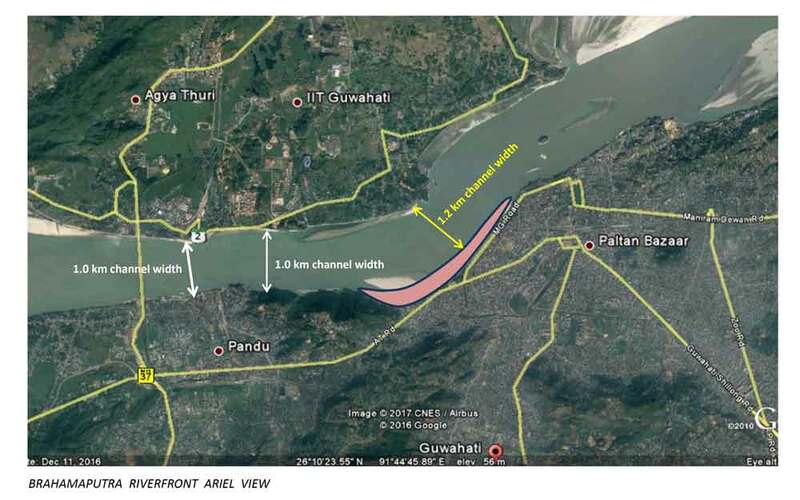 the original plan for new saraighat bridge called for building it from the city's waterfront to connect north ghy and iit campus directly than this 15km detour to old saraighat but i guess cost and geologic issues won out. it would have been very convenient to expand the city north side of river. south, east, west side is hemmed in by wetlands and hills. that yellow lined 1.2km channel width was where it would have been far more value add. where the pink beach ends left side is kamakhya hill with two temples on top - kamakhya and bhubaneswari .... this 1km is about the narrowest point in the river and hence GHYs "strategic" pindi type location as a chokepoint .... upstream and downstream, its a boundless vast 'sea' if you look at google earth. the part where dhola sadiya bridge crosses is another bigger sea which is amazing on google earth. NEW DELHI: Work on building a road tunnel across the Zoji La Pass, providing the Kashmir Valley with allweather access to Ladkah, a strategically important border region, will begin May 19. Prime Minister Narendra Modi is scheduled to lay the foundation stone for the Rs 6,809-crore project spanning over 14.2 km, which is expected to be completed in 2026. Another crucial 6.5 km tunnel at Z-Morh on this stretch of Srinagar-Leh highway is likely to be completed next year. inevitable anyway, to open 2nd fat pipe to chennai. HSR will follow the road. 1. This Port-Sriperumbudur 6-lane elevated corridor to connect the Chennai port, as well as the BLR expressway, along with the long overdue 6/8 laning of NH-4 (40km) up to Ranipet (anyone driving to Chennai from BLR side will know how painful this stretch is). 2. The BLR e-way itself, starting from Sriperumbudur. 5. A similar elevated-corridor on the northbound NH-5/Kolkata highway for 15 km near Red Hills. 2. 6-lane bypass road from Madurantakam on NH-45/GST road to connect to the OMR at Thiruporur, which will help decongest the southern entry points to the city and diffuse city-bound traffic well before Chengalpattu itself. 3. A 162-km long peripheral ring road between Mahabs in the south and Kattupalli in the north, with dedicated connectivity to Ennore and Kattupalli ports. 4. 6-laning of ECR up to Mahabs and perhaps beyond (I am hoping so). 5. Early days yet, but CMDA wants to build a further ring road linking all the satellite towns in the extended metro limits with a 190-km STRR, connecting Mahabs, Chengalpattu, Kanchipuram, Arakkonam and Gummdipoondi. Only the Tirupati highway (NH-205) is in limbo, and continues to languish with a 4-lane road, after NHAI's 8-lane alignment plan was scuttled by locals along the route. Last edited by arshyam on 13 May 2018 21:01, edited 1 time in total. 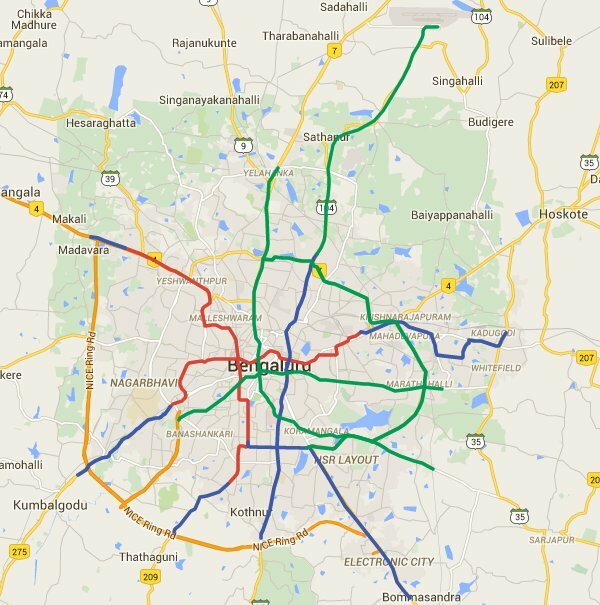 Regarding the BLR e-way, all the announcements seem to be concentrated on the Chennai side, but nothing in BLR. What happens after one exits the e-way at Hoskote? Getting on the regular KR Puram-ITI-Tin Factory route will waste away all the gains of taking the e-way. The STRR may be too far out of the city to help, so not sure how this will work. The road from Attibele-Sarjapur-Varthur-Whitefield-Hoskote route is an option, but seems to be another 80-ft street unless money is spent to widen it. From south BLR, it looks like the existing Hosur-Krishnagiri-Vellore route itself will continue to be the best option, unless I am willing to spend 2+ hours in ORR/OMR traffic to cross the KR Puram bridge. BLR's lack of planning multiple routes/options to decongest chokepoints like Silk board or Tin factory keeps biting the city year after year. It's a gift that keeps on giving. I hope the HSR comes up as soon as e-way construction starts. If BJP comes in Ka, high chances of it. HSR is not luxury in this route, but a necessity. As Suraj mentioned, this line is too short for over night travel and too long for day travel. All the trains run full, the buses are notoriously unpunctual and very inconvenient, takes 2-3 hours to exit city if boarded at Koyambedu in Chennai or Majestic in Bangalore. Can they build tunnels under metro-pillars? I am guessing they can since tunneling is done underneath buildings, but asking just in case. That bridge has to go if KR Puram wants to see any relief, or land is found magically for a parallel 4-lane bridge. The idiotic metro plan that has two parallel viaducts for each line through Tin factory is going to make it worse. Karthik S wrote: I hope the HSR comes up as soon as e-way construction starts. If BJP comes in Ka, high chances of it. HSR is not luxury in this route, but a necessity. As Suraj mentioned, this line is too short for over night travel and too long for day travel. All the trains run full, the buses are notoriously unpunctual and very inconvenient, takes 2-3 hours to exit city if boarded at Koyambedu in Chennai or Majestic in Bangalore. Agreed. 20+ flights, two 16/17 coach Shatabdi expresses, a 11-coach AC double decker, 3 24-coach intercity expresses, 2 overnight mail trains, hundreds of bus services (KSRTC Airavat's cash cow route), and who knows how many self-drive cars cover this route daily. A veritable conveyor belt, to quote an SR spokesperson in the past. But the HSR will be effective only with proper end-points. In that sense, BKC in Mumbai is an excellent terminal point. Thing is, space is very difficult to get in BLR, so I am not sure where the HSR could be terminated. Chennai is easier due to favourable soil geology making tunneling feasible. Like the Mumbai-ADI HSR, a tunnel can be built up to the Guindy race course, under which a station can come up. Of course, a part of the race course will have to temporarily close while construction happens, but the good thing is that it can restored easily. There is no green cover there, so soil depth for replanting trees is not an issue here. Connectivity is also good, with GST, ring road and Anna salai and the rich areas of Abhiramapuram-Mylapore-Adyar in proximity, and not too far from the OMR IT area. An IR station and metro station next door also helps. The metro connects Anna salai and the airport directly, which is another bonus. What is a corresponding location in BLR? The race course near Majestic is similarly an option, but tunnelling in BLR is a pain and may not be economically feasible. And getting there will be painful, so a stop somewhere near ORR/KR Puram will be needed to generate patronage. Another option is the NGEF area in Baiyyappanahalli - right next to the upcoming IR terminal. Perhaps better area from the IT PoV, but difficult for old-moneyed Basavanagudi/Malleswaram folks to reach. And the problem of tunnelling or land for elevated viaducts still remain - how will the line get there? HSR will have to solve what is optional for the expressway - a viable route into the city. You have to terminate it so that you can build an interchange station with a metro line. Or else it'll be like the brain dead plan of shifting cantonment metro station half an km away from the railway station. On both ends. If you run multiple hsr trains you'll need to evacuate them quickly. True, even then, the GW is notorious for daily pile-ups, having been stuck in a few myself. Lincoln and Holland tunnels are even worse. But NYC has an excellent rail n/w making cars superfluous. High tolls, lack of, and expensive parking, also discourage personal transport. So no one in their right minds even thinks of taking the car into the city. But to be fair, NYC-BLR is not a fair comparison . Mumbai is a more worthy candidate, and won't do too badly in such a comparison. There is no need to have one ‘perfect’ station in BLR . The Tokaido Shinkansen (Tokyo Osaka) stations technically aren’t all perfect . Tokyo has three Shinkansen stops on that line . The main station is on the east/southeast . There’s nothing close to the whole arc between Ueno-Shinjuku (approx northeast to southwest) , until Shinagawa. Yokohama is really for that suburb itself . But it works fine - metro connectivity is excellent . Osaka is even worse - Shin Osaka station is far out of town, like Hosur. Again very well connected - I’ve taken both subway and car from there to city . Singha’s suggestion of a station at a major transport hub is fine . Remember the majority of the travelers will be commuters with small bags . For them the greatest benefit would be the 90 minute travel time between cities at 320kmh max. It would be ok with 1-2 not so perfect locations for stations in BLR, than one perfect one. It's not a bad idea, actually. Since the metro will be integrated, traffic can be managed on the 6-lane surface road and 4-lane elevated road (I am not including service lanes into account). Unlike BLR's ORR, the OMR has a decent number of diffusion points which does not concentrate traffic like in BLR. The Shols junction, and Thoraipakkam radial road take a lot of traffic away, as does the Kandanchavadi bypass near the AMZN office. SRP and Tidel park junctions are the major problems, but they are manageable - the Indira nagar bridge is a good alternative, for ex. MRTS to VLCY was planned in the seventies saar, and it will become more useful once the connection at St Thomas mount station is completed. Then the original planned ring railway will be complete, albeit as a metro for the remaining stretch. But SR did miss a trick in not adding in a baby track at Thiruvanmiyur MRTS station which would have kept the option for an OMR extension. I suppose it's even now possible to re-design the station as a junction, but given IR's notorious delays (exhibit A: the existing MRTS line itself), no one wants to consider that option. Arshyam boss I have lost my mind, I take the car everytime I go into the city and manage to park most of the time without paying anyone. There is a way, difficult but possible. Occassionlly i have to pay 20-30 bucks.How about parking next to Macy,s in time square on a saturday in the busiest place in America. Impossible , no possible. I did it and I did not believe my luck so waited till the traffic policeman came to double check . I told him, who said miracles do not happen in NewYork, he smiled.Just 10 feet away across the other side of the street you get towed. Last mile connectivity may not be possible with HSR stations. If the Station comes up in Bommasandra or Whitefield, the passengers can switch to Metro from there and travel to any part of the city. We need to keep in Mind that Chennai Bangalore could well be part of Mumbai - Chennai HSR line in the future, if we build a HSR station within city, again it will be arduous job to build track up north towards Mumbai. Therefore, having a HSR line on the outer with direct connectivity to any metro line will be better. That’s the case with Shin-Osaka station (shin is Japanese for ‘new’). It’s not near the center of Osaka, but makes the alignment of both the bullet train line from Tokyo and the onward line to Hakata and beyond easier . There are lots of cabs, trains and buses to various parts of Osaka from the Shinkansen station though . Given the way BMRCL insists on planning (or the lack of it), I don't have any hopes of seamless connectivity if the station is built outside the city. See their pig headed-ness in planning the Cantonment metro station "integration" (it's a kilometre away in some playground). Whitefield and KR Puram are gearing up to be the same. This is despite the experience of poor planning at Majestic, Banashankari and pretty much everywhere else. The only two railway stations that are somewhat integrated are Yeshwantpur and Baiyyappanahalli. But I agree that it may be the only option given feasibility and extensibility. the green phase3 are the key areas of ITvity and usual will be done last. it will bring connectivity to hebbal, marathalli, ORR, sarjapur road, HSR, koramangala ..... ideally it should be underground given the ORR conditions but I am sure they will find a way to erect tall pillars and make lives miserable for years using the time honed excuses of cost and "hard rock saar"
overground metro on old airport road will be a feat for sure. Itanagar (Arunachal Pradesh) [India], May 17 (ANI): The Border Roads Organisation (BRO) has created history by establishing a road link to India's border with China beyond Limeking and along the Tama Chung Chung (TCC)-Taksing Axis recently. The road from Limeking now connects TCC to Taksing, covering a distance of approximately 80 kilometers. This achievement could be considered historic as the road reaches China border after the infamous 1962 China War. The BRO's 23 BRTF commander Col Tanish Kumar, told ANI today, that the team, including 128 RCC OC Lt.Col. Raju Pradhan, Capt. Vijendra Singh and Capt. Nikhil drove from Limking to Taksing for spot verification. The TCC-Taksing road work begun in 2009 and continued unabated despite number of challenges & hindrances, including inhospitable terrain, inclement weather conditions with rains for almost nine months in a year, no access to this stretch of uncut road having dense foliage, undergrowth, rugged and steep mountains while ferocious River Subansiri flowing nearby posed greatest challenge for transportation of men and materials. Prime Minister Shri Narendra Modi will attend the commencement of work on Zojila Tunnel on the Srinagar-Leh National Highway at an event in Jive-tsal in Leh tomorrow. He will also lay the foundation stone for Srinagar Ring Road and Jammu Ring Road at separate events at Sher-e-Kashmir International Conference Centre (SKICC), Srinagar and at General Zorawar Singh Auditorium in Jammu the same day. Union Minister for Road Transport & Highways, Shipping, Water Resources, River Development & Ganga Rejuvenation Shri Nitin Gadkari will also be present at the events. The 14 km long Zojila tunnel will be India’s longest road tunnel and Asia’s longest bidirectional tunnel. The Cabinet Committee on Economic Affairs, chaired by the Prime Minister Shri Narendra Modi, had approved the construction, operation and maintenance of this 2-lane bi-directional tunnel with Parallel Escape (Egress) tunnel between Baltal and Minamarg on the Srinagar-Leh section of NH-1A at a total cost of Rs 6800 crore earlier this year. The construction of this tunnel will provide all weather connectivity between Srinagar, Kargil and Leh. This route remains snow-bound for a large part of the year, and is ravaged by frequent avalanches. As a result, road connection to places in the Laddakh region stands disrupted for long periods, preventing even essential supplies from reaching people, shutting down businesses, affecting healthcare and education. The tunnel will bring relief to the people of this region by providing all weather connectivity. It will also cut down the time taken to cross the Zojila pass from the present 3.5 hours to just 15 minutes, besides making the drive much safer and convenient. The construction of the tunnel is expected to bring about all round economic and socio-cultural integration of these regions. In addition to direct jobs generated during construction, it will also lead to massive indirect and spinoff jobs due to acceleration of economic growth. The government is committed to development of manpower skilled for tunnelling jobs in Jammu & Kashmir. The project has strategic and socio-economic importance, and will be an instrument for the development of the economically backward districts in Jammu & Kashmir. The Zojila tunnel has been planned as a smart tunnel. It will have latest safety features like fully transverse ventilation system, Uninterrupted Power Supply (UPS), Tunnel Emergency Lighting, CCTV Monitoring, Variable Message Signs (VMS), Traffic Logging Equipment, Over Height Vehicle Detection, Tunnel Radio System, etc. It will have pedestrian cross passages at every 250 meter and motorable cross passages and lay-bys at every 750 meter. It will have emergency telephones and fire-fighting cabinets at every 125 meter. The Ring Roads and Srinagar and Jammu are aimed at reducing traffic congestion at these cities and making road travel safer, faster, more convenient and more environment friendly. The 42.1 Km, 4 lane Srinagar Ring Road will link Galandar in West Srinagar to Sumbal. Being built at a cost of Rs 1860 crore, this road will provide a new route from Srinagar to Kargil and Leh, and reduce travel time. There will be a major bridge, three flyovers, 23 tunnels and 2 via-ducts on this route. The 58.25 km, 4-lane Jammu Ring Road, being built at a cost of Rs 2023.87 crore, will link Jagati (western Jammu ) to Raya Morh. There will be 8 large bridges, 6 flyovers, 2 tunnels and 4 via ducts on this route. The Prime Minister, Shri Narendra Modi, will be on a day-long visit to Jammu and Kashmir on May 19, 2018. The Prime Minister will attend the Closing Ceremony of the Birth Centenary Celebration of the 19th Kushok Bakula Rinpoche in Leh. At the same event, he will unveil a plaque to mark the commencement of work on the Zojila Tunnel. The 14 km long Zojila tunnel will be India’s longest road tunnel and Asia’s longest bi-directional tunnel. The Cabinet Committee on Economic Affairs, chaired by the Prime Minister, had approved the construction, operation and maintenance of this tunnel between Baltal and Minamarg, on the Srinagar-Leh section of NH-1A, at a total cost of Rs 6800 crore earlier this year. The construction of this tunnel will provide all-weather connectivity between Srinagar, Kargil and Leh. It will cut down the time taken to cross the Zojila pass from the present three and a half hours, to just fifteen minutes. It will lead to all-round economic and socio-cultural integration of these regions. It also has immense strategic importance. The Prime Minister will dedicate the 330 MW Kishanganga Hydropower Station to the Nation, at the Sher-i-Kashmir International Conference Centre (SKICC) in Srinagar. He will also lay the Foundation Stone of the Srinagar Ring Road. At the General Zorawar Singh Auditorium in Jammu, the Prime Minister will lay the Foundation Stone of the Pakul Dul Power Project, and the Jammu Ring Road. He will also inaugurate the Tarakote Marg and Material Ropeway of the Shri Mata Vaishno Devi Shrine Board. The Tarakote Marg will facilitate pilgrims visiting the shrine. The Ring Roads in Srinagar and Jammu are aimed at reducing traffic congestion at these cities and making road travel safer, faster, more convenient and more environment friendly. The Prime Minister will also attend the Convocation of the Sher-e-Kashmir University of Agricultural Sciences & Technology, Jammu.